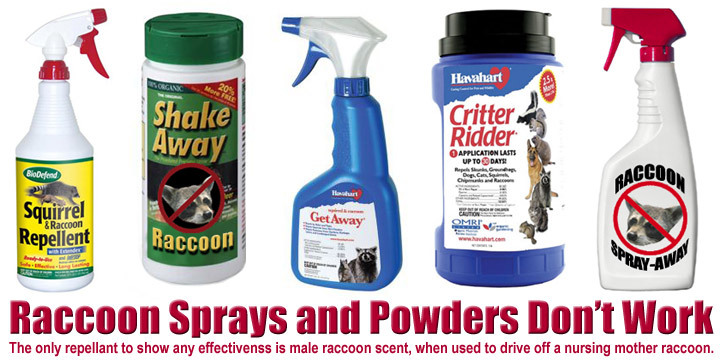 10.11.2003 - I get a lot of phone calls and emails asking about raccoon repellent. I respond to all of these emails explaining that there is no such thing as an actual effective raccoon repellent or deterrent. Many are marketed and sold. Some of the most common repellants sold are simply mothball flakes. They don't work, they can actually make you sick, and they are bad for the environment. Ammonia soaked rags don't work either. I've tried, in some very tight quarters where I thought it might work, but it does not. Some other repellents are based on predator urine. These can actually work if it's a female raccon with young who will be intimidated out of the area if she thinks that there's a predator. But it has to be a lactating female in an attic, and it doesn't always work. Ultrasonic sound machines do not work at all and the FTC has issued an official warning about their fraudulent nature. 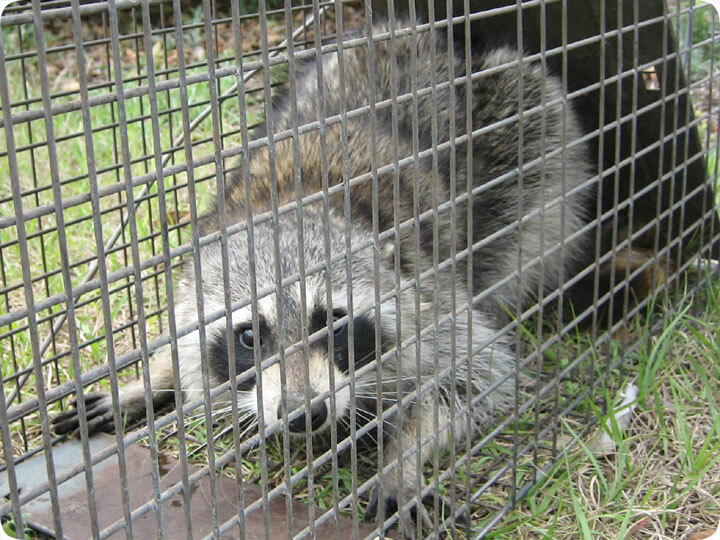 The best approach to raccoon control is to either eliminate whatever is attracting them to your home, such as keeping garbage or pet food inside, or to seal off your house so they can't get in, or when removal is absolutely necessary, to trap them in live cage traps such as shown above. Unfortunately, repellents just don't work. Raccoon repellent moth balls - Mothballs are the favorite low-cost repellent of the do-it-yourselfer. They are said to work for everything from insects to armadillos. The truth of the matter is that moth balls are not an effective repellent for anything other than what they were designed for—moths and insects. The ingredients in the pungent white balls are a mixture of a deodorizer and an insecticide. They are known carcinogens, and as such are dangerous to most humans and animals. Just because they are cancer causers doesn’t mean the smell will drive an animal away. There are a lot of hazardous substances out there we expose ourselves to everyday. I we don’t know they’re bad for us, we never learn to avoid them. Raccoons are one of the more intelligent nuisance animals a homeowner has to deal with. Because of this, if the smell of mothballs offends a raccoon, the animal is more likely to push the box out of the area or cover it over. Most professionals say that the animals seem undisturbed by the odor and act as if the mothballs aren’t even there. If you insist on trying them at least the little things are inexpensive. Remember: There is no substitute for trapping and removal.